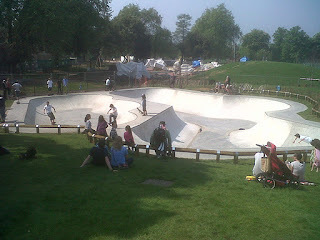 The bowls at Clissold are very popular, with a learners bowl, which is oodles of fun, and a proper sizeable offering that segregates the learners from the big boys. No street here, which is a bit of a shame, perhaps a ledge and some flat wouldn�t have hurt, but hey ho, go to Mile End if that�s your satchel. I like the table tennis table here too. Nicely done Hackney Borough.